RIVERSIDE, Calif. – Inflammatory bowel disease (IBD), of which Crohn’s disease and ulcerative colitis are the main types, is on the increase in the United States, affecting more than 1.6 million people and explaining perhaps the increase in advertisements offering treatments and cures. Another intestinal disease is colon cancer, a leading cause of death, which is linked to diet and one’s genetic predisposition to the disease. What is already known in the field of cell biology is that a transcription factor, called hepatocyte nuclear factor 4-alpha (HNF4-alpha), plays a key role in both diseases, transcription factors being proteins that help transcribe DNA into its close cousin, RNA, which is then translated into proteins which do the work of the cell. HNF4-alpha comes in two major isoforms, P1-HNF4-alpha and P2-HNF4-alpha (hereafter P1 and P2, respectively), but just how these isoforms are distributed in the gut and how each isoform plays a role in colitis and colon cancer are not understood. Now a team of researchers at the University of California, Riverside has determined the distribution of the P1 and P2 isoforms in the colon. They report in the journal eLife that maintaining a balance of P1 and P2 is crucial for reducing risk of contracting colon cancer and colitis. The intestine is the only adult tissue in the body that expresses both P1 and P2. Sladek and her team have shown for the first time that these isoforms perform non-redundant functions in the intestine and are relevant to colitis and colitis-associated colon cancer. “Our study also suggests that finding a drug to stabilize one isoform should be more effective than targeting both isoforms for treating colitis and colon cancer,” said Karthikeyani Chellappa, the first author of the research paper and a former postdoctoral researcher in Sladek’s lab. Sladek explained that the colonic epithelial surface has finger-like invaginations (into the colonic wall) called colonic crypts that house stem cells at their base. These stem cells help regenerate new epithelial cells that continuously migrate up towards the surface, thus ensuring complete renewal of the intestinal lining every three-five days. The researchers observed that the P1-positive cells were found in the surface lining and the top portion of the crypt (green in the accompanying image) while P2-positive cells were mostly in the proliferative compartment in the lower half of the crypt (proliferation marker is red in the image.) Further, when transgenic mice – genetically engineered to have only either P1 or P2 – were subjected to a carcinogen and, subsequently, to an irritant to stress the epithelial lining of the colon, the researchers found that the P1 mice showed fewer tumors than wildtype control mice. When treated with irritant alone, these mice were resistant to colitis. In sharp contrast, mice with only P2 showed more tumors and were much more susceptible to colitis. 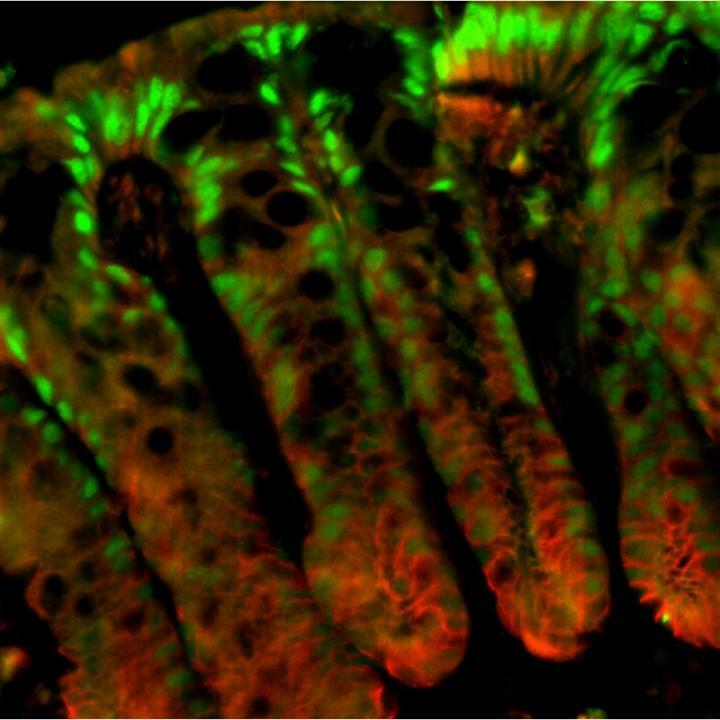 The researchers explain these findings by invoking the “barrier function” – a mucosal barrier, generated by the colon’s epithelial cells, that prevents bacteria in the gut from entering the body. In the case of P1 mice, this barrier function was enhanced. The P2 mice, on the other hand, showed a compromised barrier function, presumably allowing bacteria to pass through. Next, the researchers examined genes expressed in the P1 and P2 mice. They found that RELM-beta, a cytokine (a signaling molecule of the immune system) expressed in the gastrointestinal tract and implicated in colitis, was expressed far more in the P2 mice than the P1 mice. Sladek, Chellappa and Deol were joined in the research by; Jane R. Evans, a staff research associate; Linh M. Vuong, a postdoctoral fellow; as well as Gang Chen, Eugene Bolotin, Christian Lytle and Meera G. Nair – all at UCR; and Nadege Briançon, formerly at the Pasteur Institute. The research was supported by a grant to Sladek from the National Institutes of Health. The University of California, Riverside is a doctoral research university, a living laboratory for groundbreaking exploration of issues critical to Inland Southern California, the state and communities around the world. Reflecting California’s diverse culture, UCR’s enrollment has exceeded 21,000 students. The campus opened a medical school in 2013 and has reached the heart of the Coachella Valley by way of the UCR Palm Desert Center. The campus has an annual statewide economic impact of more than $1 billion. A broadcast studio with fiber cable to the AT&T Hollywood hub is available for live or taped interviews. UCR also has ISDN for radio interviews. To learn more, call (951) UCR-NEWS.